Can somebody explain how these forward kinematics matrix equations were formulaed? It looks (to me) like there's a typo in that answer. The approach is to recognize that you have to wind up at the same point, whether you get there via the left arm (d->e->blue dot) or the right arm (a->b->c->blue dot). I'll point out that the minus signs in there are because of the angle definitions - $\theta_1$ is defined "conventionally," starting at 0=right and getting positive counter-clockwise, where $\theta_2$ is defined opposite - starting at 0=left and getting positive clockwise. Not the answer you're looking for? Browse other questions tagged mobile-robot robotic-arm kinematics mechanism movement or ask your own question. 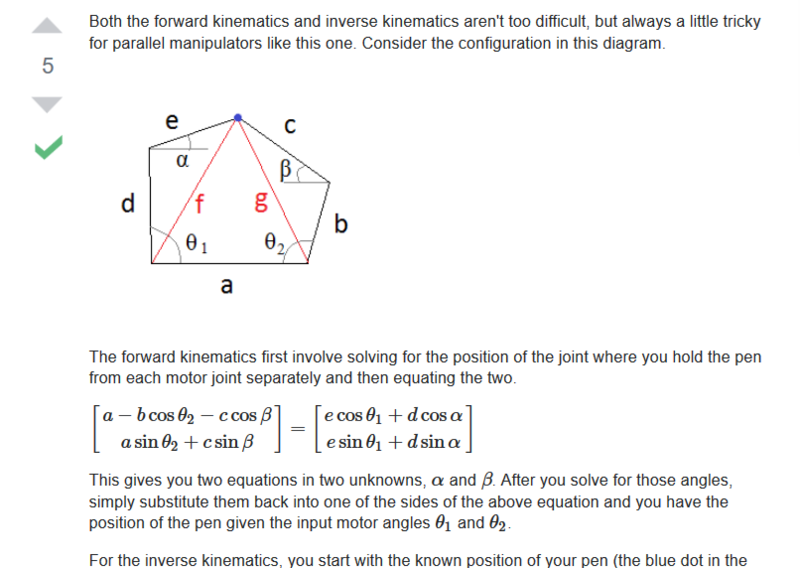 How can the inverse kinematics problem be solved? Programming Forward and Inverse Kinematics of PUMA 560?